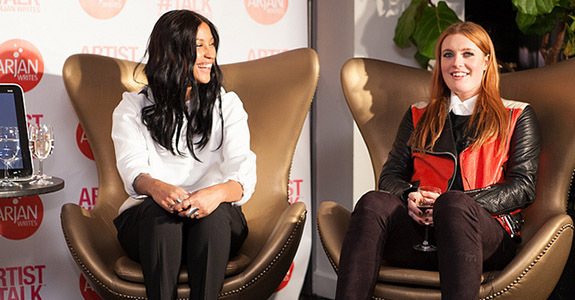 Far East Movement ARTIST#TALK with Arjan Writes! Two weeks ago, Terminal 5, one of Manhattan’s most popular concert venues was transformed into a colorful tech-music paradise. Giant computer monitors installed with Windows 8 were set up everywhere. Blue lighting effects were projected on an all white ceiling, while DJ Robbie Wilde was spinning tunes. A life-sized HP Envy Touch notebook was on the floor. It was amusing participators and spectators alike. It was a bit strange watching people step on the keys of the keyboard attempting to win a music trivia game. It was very reminiscent of Tom Hanks in the classic 80s film Big. At one point in the evening, two female contortionists dressed in silver spandex bodysuits descended from the ceiling. They performed aerial acrobatics à la Cirque du Soleil, culminating with them using HP TouchPads while still suspended from their aerial silk. It was both the strangest and most awesome product placement ever witnessed. A digital photobooth was in one corner, with props galore. A boombox, gold chains and sunglasses were just a few of the accessories to choose from. Photographs were emailed to you in a few seconds and those photos made there way to Instagram in just minutes. All of this tech and music debauchery was for the launch of Windows 8 and to celebrate Far East Movement‘s latest album Dirty Bass which was released this past summer. The theme of the night was “The Sound of Touch” and HP, Windows 8 and Arjan Writes were all delivering. Complimentary drinks were flowing from the bar and servers were walking around with trays of champagne and hors d’oeuvres. Arjan Timmermans has been doing this ARTIST#TALK series for a year now. It’s a culmination of an interview, talk show and listening party. This installment with Far East Movement was different from the others in two very significant ways. The interview took place on stage at Terminal 5 and the guests were treated to a live performance from the band! It was surreal standing on a stage where many iconic bands and artists have stood before, playing to thousands of fans while listening to Arjan interview Far East Movement about their creative process. Arjan is always curious to know where an artist finds their inspiration; he’s interested in the stories and narratives behind the songs. 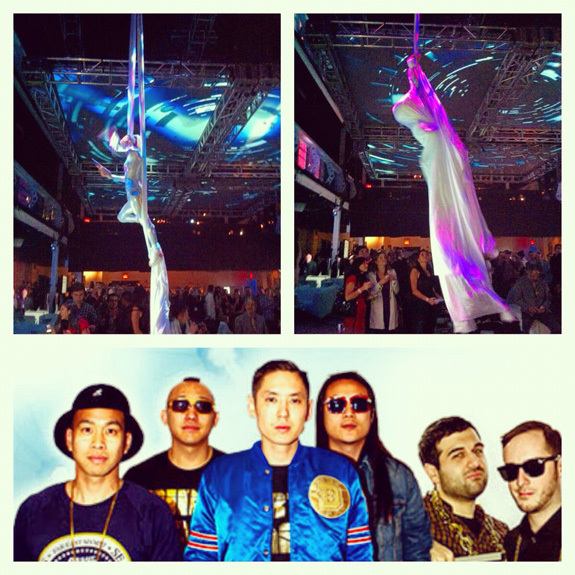 All members of Far East Movement are present; they are introduced as Kev Nish, Prohgress, J Spliff, and DJ Virman. Kev Nish does most of the talking and his demeanor is very engaging. Far East Movement are an Asian-American hip hop group from Los Angeles. Or perhaps, they are just an American hip hop group from Los Angeles. This difference is talked about at length during the interview. During the conversation with Arjan, Kev discusses the group’s ethnicity and relation to the larger pop world. They are Americans first, born and raised in LA. Kev explains that Los Angeles has always fueled their inspiration to create music. Thanks to LA’s open-mindedness and its melting pot of ethnicities, cultures and diversity they were able to exist in a world that didn’t care what their ethnicity was. Their music might not sound particularly “Asian,” but they are not denying their roots. They kept their name Far East Movement for that reason. Far East Movement’s latest album Dirty Bass is full of catchy hooks and melodies. They were inspired by the “golden era of party music,” which Kev considers to be the late 80s and early 90s. He mentions Run-DMC and Beastie Boys as pioneers of this musical movement. It was the first time hip hop mixed with rock and roll. But Far East Movement are inspired by all genres of music. They explain that their music is a mash-up of culture, genres and sounds. It mirrors their personalities and style as well. Their music and lives are fragments of everything that inspires them. On their last album they sampled Dev’s hook from “Booty Bounce” with The Cataracs and turned it into “Like a G6” and it blew up all over pop radio. Dirty Bass also features major collaborations with artists like Flo Rida, Pitbull, Justin Bieber and even Feist! One of Far East Movements most ambitious new tracks “Little Bird” borrows a melody from the Canadian singer-songwriter Feist. At first it seems like an odd pairing but they pull it off well. Their music has always been an amalgamation of all genres of music. 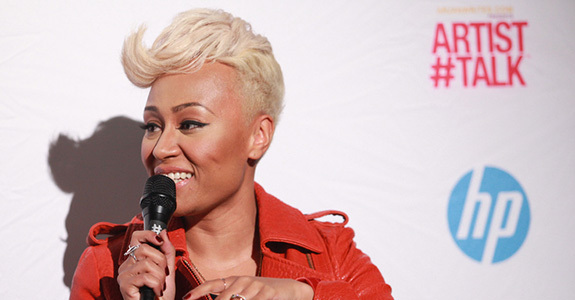 They have toured with a broad spectrum of artists from Lil Wayne and Rick Ross to their Cherrytree Records labelmates Robyn and La Roux. Kev goes on to explain that it didn’t matter what crowd of people they were performing for; they felt the energy and love from all different crowds. They channel that same energy into their infectious new single “Turn Up the Love.” When they performed the song that night at Terminal 5, it was no different. The energy was there. Once the interview was over their equipment was unveiled from under black cloths and everyone rushed to the stage for their performance. I think it’s safe to say Far East Movement turned up the love on that abnormally warm fall evening in NYC.